Our previous report on the Valley of Geysers (BGVN 32:07) discussed a major landslide on 3 June 2007 that seriously damaged the landscape and destroyed several beautiful geysers. Scientists again visited the area about two years after the landslide. One of the geysers that was a few meters underwater returned to life after the confining lake waters dropped below the geyser's rim. The following report came chiefly from Vladimir L. Leonov and his son, A.V. Leonov, who wrote an informal description of events (Leonov, 2008). The S-trending Valley of Geysers cuts radially across the topographic margin of the Geysernaya caldera at the SE end of the Uzon-Geysernaya caldera complex (figure 9). Figure 9. A relief map showing a portion of Kamchatka's Eastern volcanic front near Uzon. The various calderas are surrounded by thick ignimbrite sheets. Uzon caldera sits to the W of and alongside the neighboring Geysernaia (Geysernaya) caldera to the E. The Geysernaya caldera is cut across its SE margin by the Valley of Geysers, a famous hydrothermal field. The field was partly buried in 2007 by a landslide that dammed the river descending the Valley (Geysernaya River, BGVN 32:07). 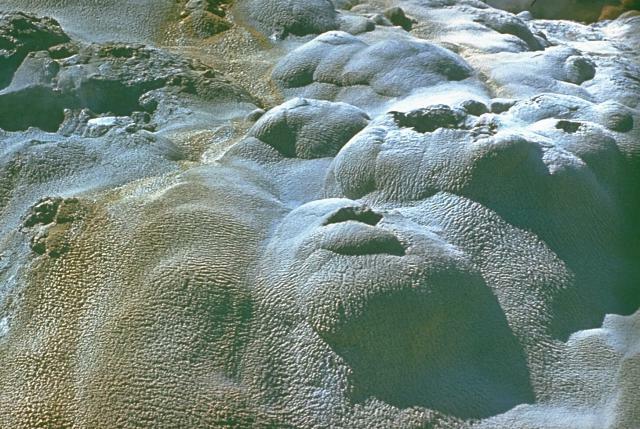 In contrast to Uzon's flat floor, Geysernaya caldera contains abundant (dominantly Pleistocene) lava domes. This map was created by the Shuttle Radar Topography Mission (SRTM) and released by NASA/JPL/NIMA. As previously reported, the landslide created a dam on the Geysernaya River, forming a lake. According to Leonov (2008), the lake surface rose to a maximum elevation of 435 m on 7 June 2007, before eroding, causing a rapid decline in water level to 426 m elevation. During July and August 2007, the Emergency and Disaster Relief Ministry and volunteers deepened the new bed of the Geysernaya River by hand to lower the lake level by another 2 m, thus freeing the Bolshoi geyser vent from the cover of lake water. After these efforts, on 19 September 2007, the Bolshoi geyser revived and erupted for the first time since the 2007 landslide. When studied in October 2008, the Bolshoi geyser (figure 10) responded to minor fluctuations of the water level in the lake. Bolshoi was seen to operate in either the regime of a geyser or in the regime of a pulsating source. When the water was low, the geyser regime was seen. With the rise of water of only about 10-15 cm (as a result rains or the melting of snow ) the water began to pour out of Bolshoi's vent in episodic pulsations. Figure 10. The Bolshoi geyser after the lake's water level had decreased 11 m from the maximum level seen earlier. The basin (vent area) of the geyser is still slightly submerged but the rim is in places out of the water. Copyrighted photo from September 2007; courtesy of Milkovo. The thickest section of landslide completely covered the 30-m waterfall at Vodopadny Creek (a branch of the Geysernaya River), and the geysers Troynoi (Triple), Sakharny (Sugary), and Sosed (Neighbor) (figures 11 and 12). Figure 11. (right) Annotated aerial photo of the middle part of the landslide along the Geysernaya River looking NE as taken by Dmitry Zadirey (Kamchatka Airlines) on 5 June 2007. The landslide flowed from upper right towards lower left. Features are as follows: a) landslide-dammed lake; b) the dam; c) the site of buried waterfall along Vodopadny Creek; d) the buried geysers Triple, Sugary, and Neighbor; e) the Gate into the Valley of Geysers (also shown in figure 12). (left) Pre-landslide view of the the waterfall along Vodopadny Creek (copyrighted photo by Igor Katkov, 2004). From Leonov (2008). Figure 12. The Gate into Valley of Geysers (left) seen before the landslide with steep canyon walls (copyrighted photo by Igor Katkov, 2004) and (right) the area after burial by the landslide (photo by Vladimir Leonov, October 2008). From Leonov (2008). Reference. Leonov, A.V., 2008, Valley of Geysers 500 days later; (URL: http://spanishflyer.livejournal.com/39861.html); accessed on 6 July 2009. Information Contacts: Vladimir L. Leonov, Institute of Volcanology and Seismology FED RAS, Far East Division, Russian Academy of Sciences, Piip Ave. 9, Petropavlovsk-Kamchatsky 683006, Russia (URL: http://www.kscnet.ru/ivs/kvert/); Milkovo (URL: http://www.milkovo.ru/); Dmitry Zadirey, Air Company Kamchatka Airlines, Yelizovo, Russia. The Global Volcanism Program has no Weekly Reports available for Uzon. 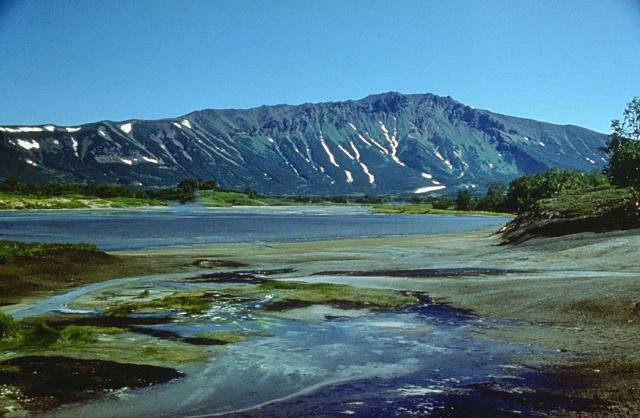 On 3 June 2007 the renowned Valley of Geysers in Kamchatka was seriously damaged by direct burial and subsequent flooding associated with a major landslide. This was communicated in a report from 28 June by the father-and-son team of Vladimir and Andrei Leonov. The Valley of Geysers is a remote geothermal area along a 4-km-long valley near the E margin of Geyzernaya caldera at Uzon-Geyzernaya volcano-tectonic depression ("U"; Leonov and others, 1991) (figure 1). Figure 1. Maps showing Uzon-Geysernaya volcano-tectonic depression on the Kamchatka Peninsula, Russia. (left) Index map of the Kamchatka Peninsula, in the NW Pacific area, showing Holocene volcano locations. (right) Shaded relief map highlighting the topographic margins of the Uzon-Geysernaya volcano-tectonic depression ("U") and the Kikhpinych stratovolcano ("K"), one of the youngest in Kamchatka's eastern volcanic zone; the hachured line indicates the SE side of a regional graben. "Ic" indicates the center of inflation. World inset location map courtesy of NASA Earth Observatory. Main maps are from Lundgren and Lu (2006), but the right map was revised by Bulletin editors to add the location and Ic symbol based on interferograms in that paper. Although the name Uzon is entrenched in the literature, the shorthand is potentially confusing since it could refer to the caldera on the W side of the complex. Both Uzon and Geyzernaya calderas support hydrothermal systems feeding thermal features. Moreover, a small cone named Uzon resides on the W rim of Uzon caldera. Accordingly, in this report we will refer to the larger complex as Uzon-Geyzernaya. The landslide which entered the Valley of Geysers is refered to as the 2007 Geyzernaya landslide. The area where the slide occurred was the subject of a recent paper (discussed below) on satellite-detected uplift on the same E side of the caldera where the slide took place (Lundgren and Lu, 2006). "Ic" indicates the approximate center of inflation detected by satellite radar interferometry using data from 2000 to 2003 (Lundgren and Lu, 2006 ). According to the Leonovs' report, several beautiful geysers have been lost, including Pervenets, the first geyser discovered by Tatyana Ustinova in 1941, and a group of geysers known as Troynoy group. The main geyser field, Vitrazh, and the largest geyser, Velikan, remained intact (table 1 and figure 2). Table 1. Summary and key to names and numbers for Valley of Geysers, about half of which were disrupted or destroyed by the 2007 Geyzernaya landslide. The numbers correspond with those on figures 2 and 3. Courtesy of Vladimir and Andrei Leonov. Figure 2. An oblique aerial view created on a base map from Google Earth software, depicting the Valley of Geysers looking E (N is to the left). The slide area and direction of flow are clearly marked, the mass having swept down the caldera's E wall. The topographically flat area in the upper right is the Pacific ocean. Note lodge at small icon in the form of a house. Thermal features indicated by symbol for spring (small circles with tail); many of these are numbered. The image also shows where the slide dammed the Geyzernaya river; the resulting lake submerged the Bolshoi and Maly geysers. Courtesy of Vladimir and Andrei Leonov. The landslide formed in the upper reaches of Vodopadny creek. The authors suggested that the main cause of the slide appeared to be the common process of gradual erosion. The nearest seismic instrument was ~ 100 km away; on that instrument at the time of the slide's onset, earthquakes were absent. Correspondence with Vladimir Leonov on 11 September revealed that the slide's computed volume was then considered to be 12-15 million cubic meters. The report also stated that this was clearly the largest historical slide in Kamchatka and possibly one of the largest in all of Russia. Later correspondence clarified this comparison as excluding debris-avalanche deposits such as those associated with lateral blasts closely associated with eruptions in 1980 at St. Helens and in 1956 at Bezymianny. The landslide of rock and mud went down the Vodopadny creek, reached the Geyzernaya river, and moved along the river to its inflow into the Shumnaya river (figures 2-4). The slide was ~ 2 km in length. A dam was formed on the Geyzernaya river with a height of up to 60 m that caused a rapid backup of water and the formation of a lake. The lake flooded the geysers Bolshoi and Maly located up the river and came close to the main "Vitrazh" geyser field. On 7 June the water level in the lake reached its maximum elevation of 435 m. Later that day the river eroded through the dam and the water level started to decline quickly. During the first four hours the water level subsided to 9 m depth. As of 28 June the main group of geysers appeared safe from flooding. Figure 3. Sketch map on 10 June 2007 showing features after the Geyzernaya landslide. N is to the upper right. The numbers correspond to those on table 1. Courtesy of Vladimir and Andrei Leonov. Figure 4. A photo looking down at the 2007 landslide from the NE rim of the Valley of Geysers. The lower portion of the landslide dammed the Geyzernaya river and backed up a lake. A surviving cluster of tourist facilities are at the slide's margin. From the Leonov's report; copyrighted photo by I.F. Delemen, Institute of Volcanology and Seismology, Far Eastern Branch of Russian Academy of Sciences (IVaS FEB RAS). In the flooding of the Bolshoi and Maly geysers, Bolshoi ended up 2 m under water, and Maly, 15 m under water. In addition, several smaller geysers?Skalisty (Rocky), Konus (Cone), Bolshaya Pechka (Gross Owen)?were also flooded. The pulsating spring Malakhitovy Grot (Malachite Grotto) was half-flooded and sometimes boiled. On 7 June a new geyser appeared in the Valley but it was active for only several hours. While the water level in the lake increased, a pulsating spring in front of Shchel geyser (perhaps The Little Prince) started to work as a geyser with eruption heights of 4-5 m. After the water level dropped, the geyser returned to a pulsating spring state. One of the landslide's tongues came close to tourist-camp buildings in the Geyser Valley (figures 2-6). Although some camp facilities were destroyed, three main houses (a hostel, a scientist's house, and a ranger's house) were undamaged. As seen in figures 5 and 6, the edge of the slide reached within about a meter of the hostel and covered parts of the adjacent wood-decked walkway. People occupied buildings when the landslide occurred but the slide halted at a point where no one was injured. Figure 5. The landslide in the Valley of Geysers left the hostel at the tourist camp just barely outboard of the deposit. The juxtaposition of the deposit and unscathed building reveals the deposit's unsorted character and clast-size distribution, which includes some large blocks several meters in diameter. This photo was shot from ten's of meters away from the hostel. Photo is from the Leonov's report; copyrighted by I.F. Delemen (IVaS FED RAS). Figure 6. Landslide rubble came to rest near the hostel's side wall. From the Leonov's report; copyrighted photo by I.F. Delemen (IVaS FED RAS). At the time of the slide, a tourist group consisting of over 20 people were in the Valley, but fortunately they were at the thermal field near the river, and only helicopter pilots and some personnel remained at the camp. In addition to stopping near the buildings, the body of the lanslide stopped 1 m before the resting helicopter, but trees carried by the slide jutted out and entangled the helicopter. The 30-m waterfall at the Vodopadny creek junction with Geyzernaya river was fully covered as well as the geyser near the waterfall. The "Thirty-meter rocks" at the entrance to the Geyser Valley were also covered by the landslide. All the small geysers, springs and thermal fields along Vodopadny creek were lost; however, the creek itself established a new course on the slide's surface. Overall assessment. Eight large geysers were still functioning at the time of the report, about half of the main geysers that existed before the landslide (table 1). Five of these still working geysers were in the Vitrazh field (Grot, Fontan, Novy Fontan, Dvoynoi, and Nepostoyanny). The three others also still working were Velikan, Zhemchuzhny, and Shchel (the latter, initially submerged but by mid-September was 8 m above the lake level and seemingly returned to normal behavior. Four large geysers were flooded by the lake (Bolshoi, Maly, Skalisty, Konus). Four were destroyed by the slide (Pervenets, Troynoi, Sakharny, and Sosed). The Geyzernaya river found a new course on the landslide's surface. Caves developed on the slide's surface hosted small lakes. In several places on the river banks observers saw the emergence of earth slumps and new boiling springs (figure 7). Figure 7. At Uzon boiling springs and plumes emerged along the banks of the dammed Geyzernaya river after the new lake's water level dropped. Copyrighted photo by Igor Shpilenok; taken from the Leonovs' report. Other information. Igor Shpilenok, a nature photographer, has posted on the web a suite of impressive before-and-after photos. The photos include shots of the upland area that spawned the landslide prior to the event. On 20 June, Jesse Allen from NASA published an article about the slide discussing a satellite image of the area captured on 11 June. He noted "The Advanced Spaceborne Thermal Emission and Reflection Radiometer (ASTER) on NASA's Terra satellite captured this infrared-enhanced image on [11 June] 2007, a week after the slide. The image shows the valley, the landslide, and the new thermal lake. Even in mid-June, just days from the start of summer, the landscape is generally covered in snow, though the geologically heated valley is relatively snow free. The tree-covered hills are red (the color of vegetation in this false-color treatment), providing a strong contrast to the aquamarine water and the gray-brown slide. Lundgren and Lu (2006) noted that their satellite interferometry data showed significant deformation spanning 2000 to 2003. During that interval, they noted ~ 0.15 m of inflation occurred at Geyzernaya caldera. As previously mentioned, the data indicated an area of uplift centered roughly at point Ic on figure 1. In contrast, during1999-2000, and 2003-2004 the radar data failed to indicate significant deformation. Lundgren and Lu (2006) point out that the surface-incidence angles (angles from the vertical) are nearly as sensitive to horizontal as to vertical displacements in the range direction (to the WNW). Based on the maps by Leonovs shown above, the upper portion of the landslide was directed roughly the same way (NW). For the 2000-2003 interval, modeling by Lundgren and Lu (2006) suggested the main regions of uplift occured beneath central and eastern parts of the Uzon-Geyzernaya volcano-tectonic depression, with extension beyond the caldera to the NE beneath Kikhpinych volcano. Uplift was bounded to the ESE by the graben (the linear feature cutting E of the caldera in figure 1). Figure 8 shows synthetic-aperture radar (SAR) interferograms, where each shading cycle represents 2.8 cm of line-of-sight displacement at the surface. Hatched lines indicate the caldera rim. This interferogram stems from radar images during the date range 19 September 2000-11 August 2003. This is only one of several interferograms Lundgren and Lu (2006) presented for the interval of significant surface displacement. Figure 8. A radar interferogram for Uzon and vicinity showing over 10 cm of uplift centered on the caldera's E rim. The image was also associated with a stated perpendicular baseline Bp=58 and RADARSAT-1 beam and surface-incidence angle from vertical for Beam 4 of 38°. From Lundgren and Lu (2006; their figure 2c). References. Leonov, V.L., Grib, E.N., Karpov, G.A., Sugrobov, V.M., Sugrobova, N.G, and Zubin, Z.I., 1991, Uzon caldera and Valley of Geysers, in Active Volcanoes of Kamchatka, edited by S.A. Fedotov and Y.P. Masurenkov, Nauka, Moscow, p. 92-141. Lundgren, P., Lu, Z., 2006, Inflation Model of Uzon Caldera, Kamchatka, Constrained by Satellite Radar Interferometry Observations: Geophys. Res. Ltrs, 16 March 2006 (Vol. 33, No. 6, L06301, Paper No. 10.1029/2005GL025181) (PDF file currently available at http://volcanoes.usgs.gov/insar/public_files/Lundgren_Lu_Uzon_GRL_2006.pdf). Information Contacts: Vladimir L. Leonov and Ivan F. Delemen, Institute of Volcanology and Seismology, Far Eastern Branch of Russian Academy of Sciences (IVaS FEB RAS), 9 Piip Boulevard, Petropavlovsk-Kamchatsky, Kamchatka 683006, Russia; Andrei V. Leonov (URL: http://www.kscnet.ru/ivs/expeditions/2007/Geyser_Valley-06-2007/Geyser_Valley-06.htm); Igor Shpilenok, Russian Nature Photography, Chukhrai, Suzemsky raion, Bryansk oblast, 242181, Russia (URL: http://www.shpilenok.ru/); Jesse Allen, NASA Earth Observatory (URL: http://earthobservatory.nasa.gov/). 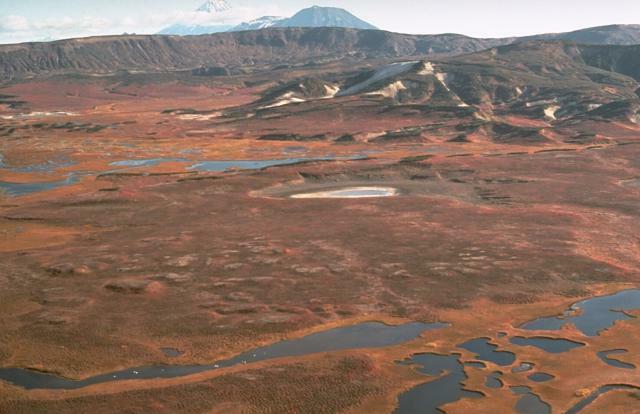 The twin Uzon and Geysernaya calderas, containing Kamchatka's largest geothermal area, form a 7 x 18 km depression that originated during multiple eruptions during the mid-Pleistocene. Widespread ignimbrite deposits associated with caldera formation have a volume of 20-25 km3 (exclusive of airfall deposits) and cover an area of 1700 km2. Post-caldera activity was largely Pleistocene in age and consisted of the extrusion of small silicic lava domes and flows and maar formation in the Geysernaya caldera. 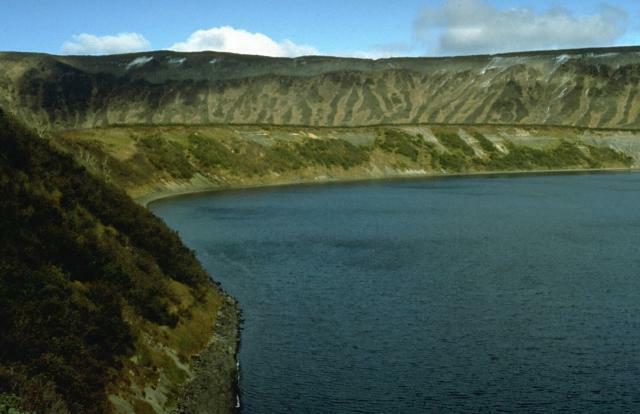 The Lake Dal'ny maar in the NE part of the 9 x 12 km western caldera, Uzon, is early Holocene in age, and several Holocene phreatic eruptions have been documented in the Geysernaya caldera. The extensive high-temperature hydrothermal system includes the many hot springs, mudpots, and geysers of the Valley of Geysers, a 4-km-long canyon on the SE margin of the Uzon-Geysernaya depression. Hydrothermal explosions took place in the caldera in 1986 and 1989. Belousov V I, Grib E N, Leonov V L, 1983. The geological setting of the hydrothermal systems in the geysers valley of Uzon caldera. Volc Seism, 1983(1): 65-79 (English translation 1984, 5: 67-82). Egorova I A, 1993. Age and paleogeography of the formation of volcano-sedimentary deposits in the Uzon-Geizernaya caldera depression, Kamchatka (according to palynological data). Volc Seism, 15: 157-176. Florenskii I V, 1984. On the age of Uzon and Krasheninnikov calderas. Volc Seism, 1984(1): 102-106 (English translation 1988, 6: 147-154). Grib V N, Leonov V L, 1994. Ignimbrites of the Uzon-Geizernaya volcano-tectonic depression, Kamchatka: geologic sequences, compositions, and formation conditions. Volc Seism, 15: 527-548 (English translation). Leonov V L, Grib E N, 1999. Calderas and ignimbrites in the Uzon-Semyachik area of Kamchatka: new data from field work on the Shirokoe Plateau. Volc Seism, 20: 299-320 (English translation). Vlasov G M, 1967. Kamchatka, Kuril, and Komandorskiye Islands: geological description. In: Geol of the USSR, Moscow, 31: 1-827. Zolotarev B P, Karpov G A, Eroshchev-Shak V A, Artamonov A V, Grigoriev V S, Pokrovsky B G, 1999. Evolution of volcanism in the Uzon caldera, Kamchatka. Volc Seism, 20: 675-694 (English translation). Reference List: Pritchard and Simons 2004; Lundgren and Lu 2006; Kugaenko and Saltykov 2010. Kugaenko, Y. and V. Saltykov, 2010. Kamchatkan valley of the geysers: Geodynamic processes, seismicity, landsliding. Proceedings World Geothermal Congress 2010, Bali Indonesia. There is no Emissions History data available for Uzon. The Lake Dal'ny maar, located on the northern floor of Uzon caldera, formed about 7600-7700 years ago. Tephra deposits from this eruption are not found more than 5 km from the lake. The 1-km-wide maar is surrounded by a low, 60-m-high tephra ring, which forms the flat slope on the far side of the lake. The northern wall of Uzon caldera rises sharply behind it. 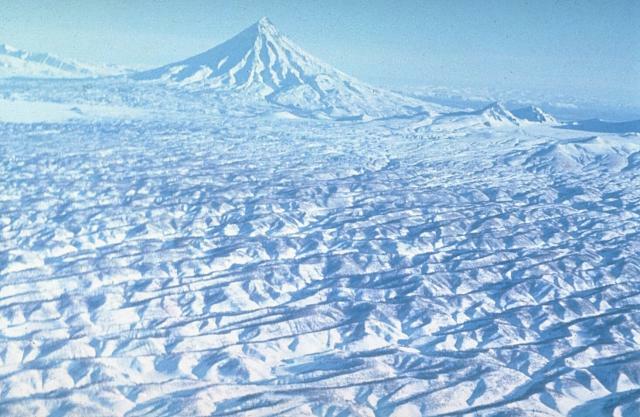 The Uzon and Geyzernaya calderas, containing Kamchatka's largest geothermal area, form a 7 x 18 km depression that originated during the mid-Pleistocene. Post-caldera activity was largely Pleistocene in age, although the Lake Dal'ny maar formed during the early Holocene. This view looks from the SW across the flat caldera floor, which is dotted with numerous lakes, streams, and thermal areas. Sharp-peaked Kronotsky volcano and flat-topped Krasheninnikov volcano appear in the distance beyond the north caldera rim. 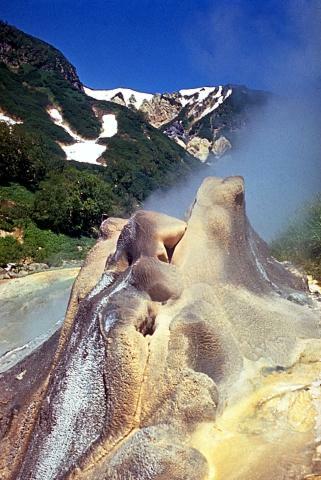 The Dvoinoi (Sugar) geyser is one of nearly 30 found in the "Valley of Geysers," a major geothermal area along a 4-km-long valley near the eastern margin of the Geysernaya caldera at Kamchatka's Uzon volcano. High heat flux near the eastern ring faults of the caldera produces active geysers, boiling hot springs, and mudpots in one of Kamchatka's most dramatic geothermal areas. Photo by Sakharnii (courtesy of Oleg Volynets, Institute of Volcanology, Petropavlovsk). The Vostochnoya thermal field in the northern part of Uzon caldera contains a large number of thermal lakes and springs. A narrow 200-300 m wide zone about 5-km long is dotted with fumaroles, boiling hot springs with colonies of blue-green algae, mudpots, and small mud volcanoes. The northern caldera wall forms the ridge in the background. Photo by V.N. Nechaev (courtesy of Oleg Volynets, Institute of Volcanology, Petropavlovsk). Extensive areas of "geyserite," deposits of siliceous sinter, have formed in the Valley of Geysers, a major geothermal area at the eastern end of the Uzon-Geysernaya caldera complex. Nearly 30 geysers are found here. There are no samples for Uzon in the Smithsonian's NMNH Department of Mineral Sciences Rock and Ore collection. Large Eruptions of Uzon Information about large Quaternary eruptions (VEI >= 4) is cataloged in the Large Magnitude Explosive Volcanic Eruptions (LaMEVE) database of the Volcano Global Risk Identification and Analysis Project (VOGRIPA).